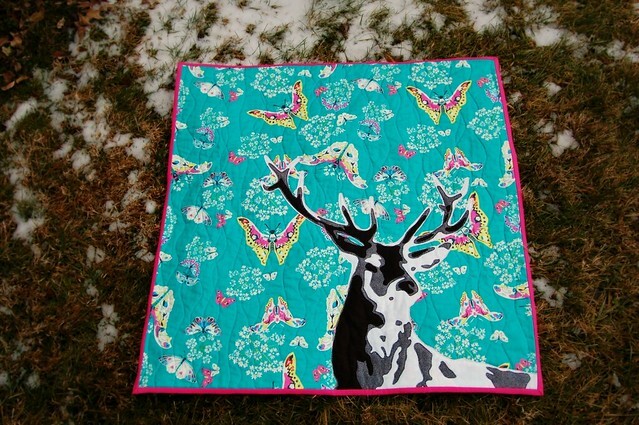 When I heard that a friend in Florida had a new granddaughter, I instantly wanted to make her this little deer quilt. Years ago, we both blogged and had names we used online for our kids. I had Tall One and Little One (which is how we assumed the dogs told the kids apart) and my friend had Mini Me and Lumberjack. Well, time flies and children grow. 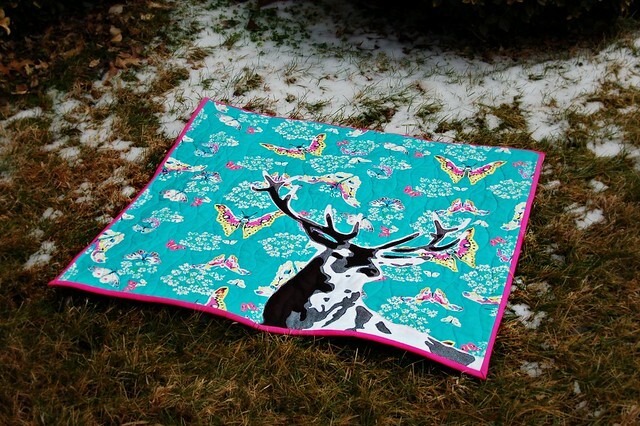 Lumberjack is a Daddy, and a deer quilt seems like a perfect fit for a Lumberjack’s beautiful daughter. 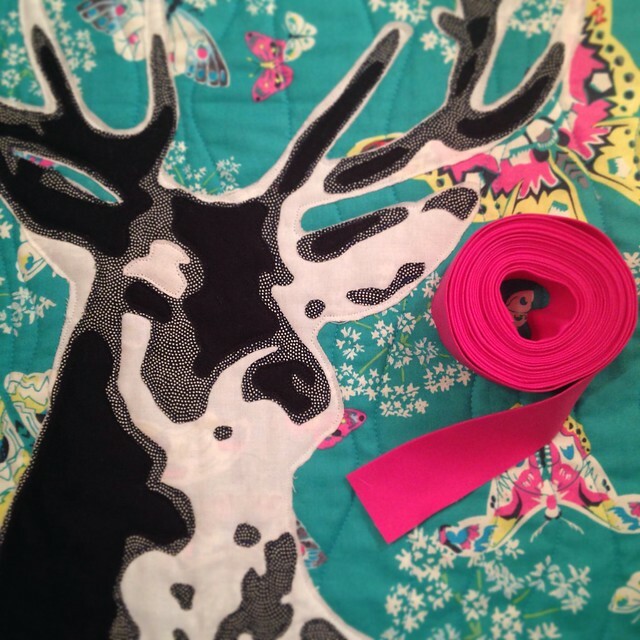 I’m really pleased with that bright pink binding against the blue, and I’m so in love with the deer that I may need to make myself one to keep. The pattern is free from the hugely talented Luke Haynes, with a PDF pattern and instructions at We All Sew. While it looks complicated, the steps are broken down nicely and it’s all easy to follow. It seems pretty forgiving of small mistakes, too. 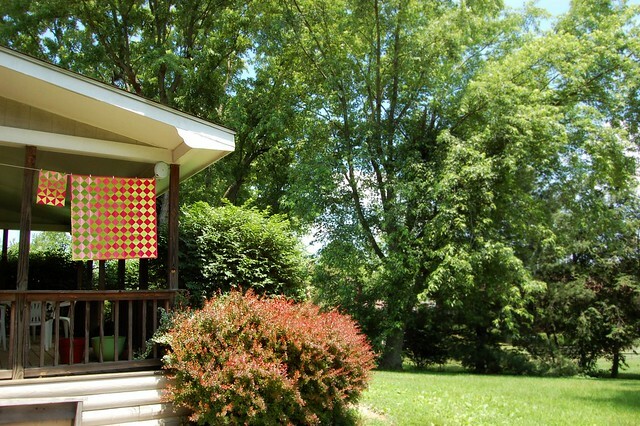 If you like the quilt and you sew at all, give it a try. 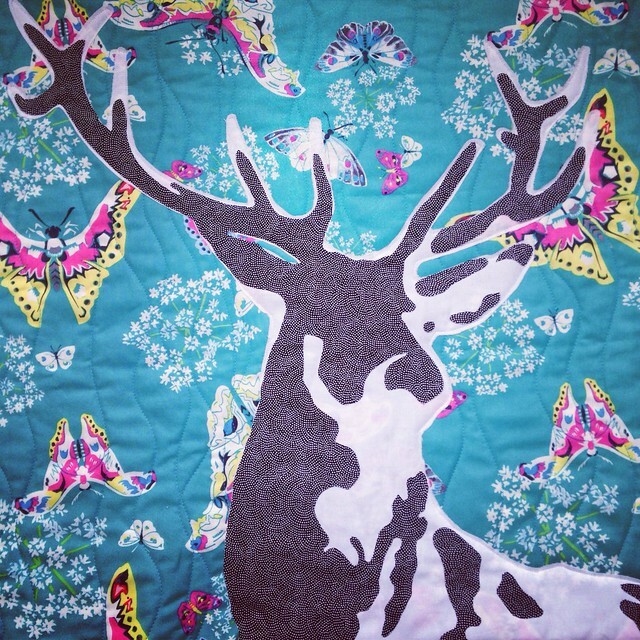 My current work in progress is a sweet little deer baby quilt. I’ll post more about it when it’s finished, but I thought you might like a peek of how it looks right now. 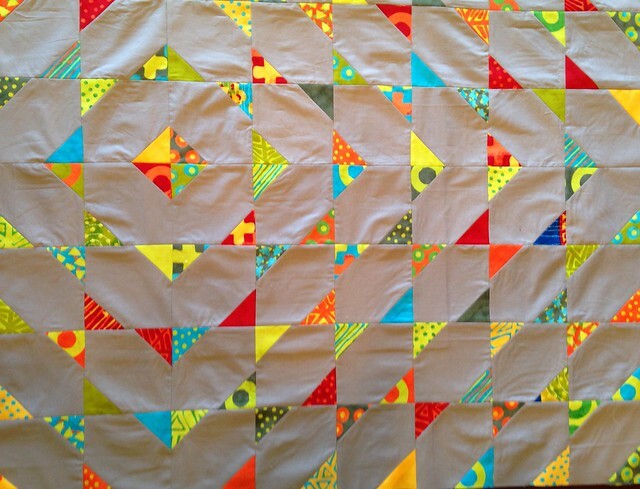 In the last photo, the medium tone fabric isn’t yet sewn down, it’s just laying on the white. (Oh, what a challenge that is going to be!) 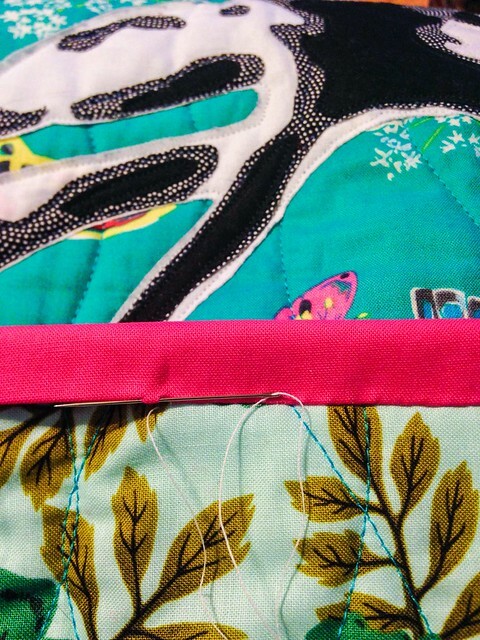 There will be one more layer of darker fabric to add a little more detail and dimension. 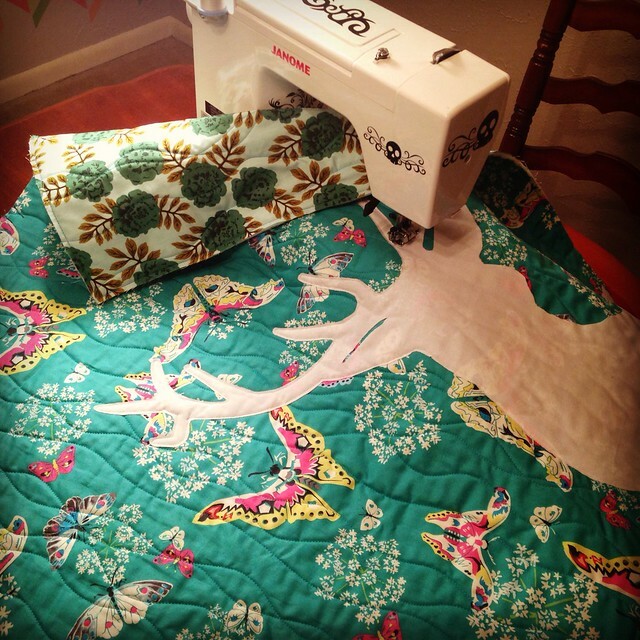 I started this little quilt on Christmas Eve, when I had a surprise day off and my husband took our daughters out for their annual breakfast and shopping date. 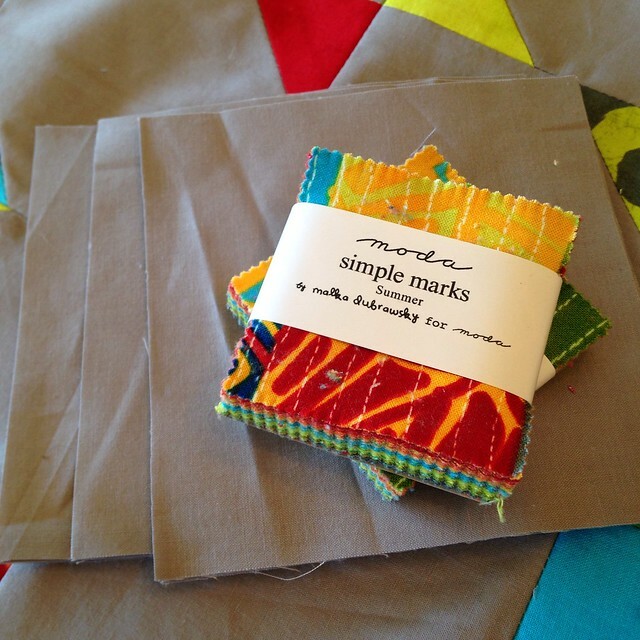 I started with a few mini charm packs of Simple Marks Summer by Malka Dubrawsky and some Michael Miller Cotton Couture in Stone. 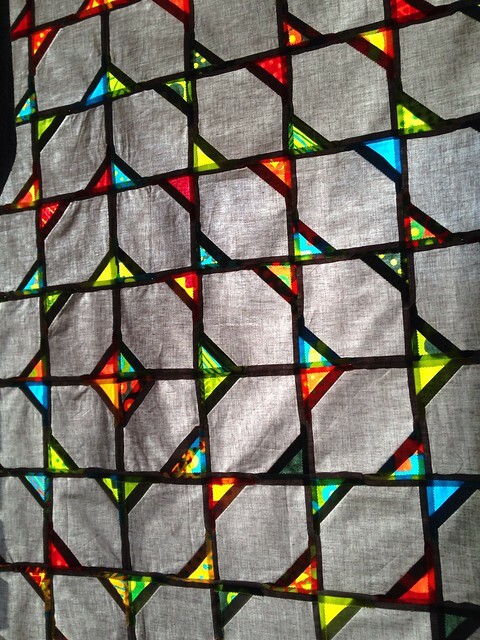 And as always, sunlight through a quilt is just magical! But harsh winter sunlight is not quite as kind. 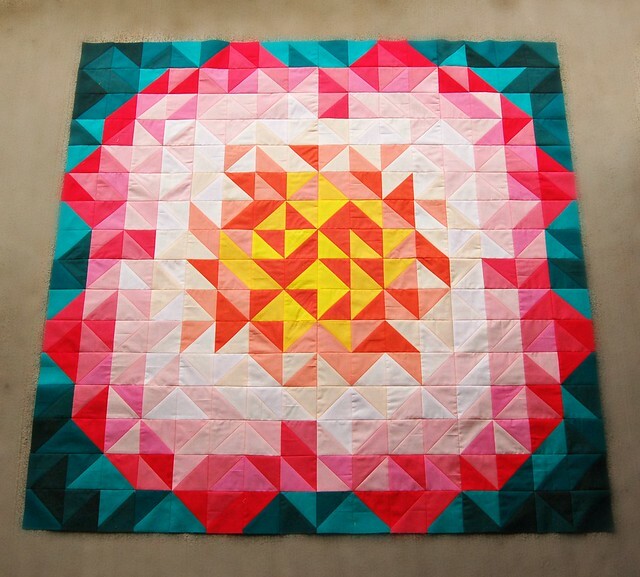 I had a really hard time getting decent pictures of the finished quilt. 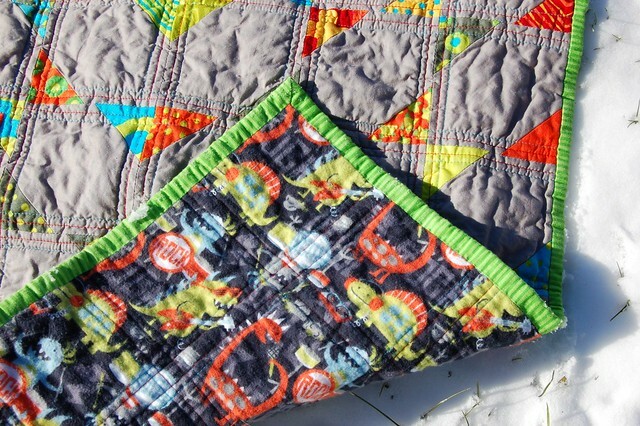 The back is a super soft rock-n-roll dinosaurs flannel. 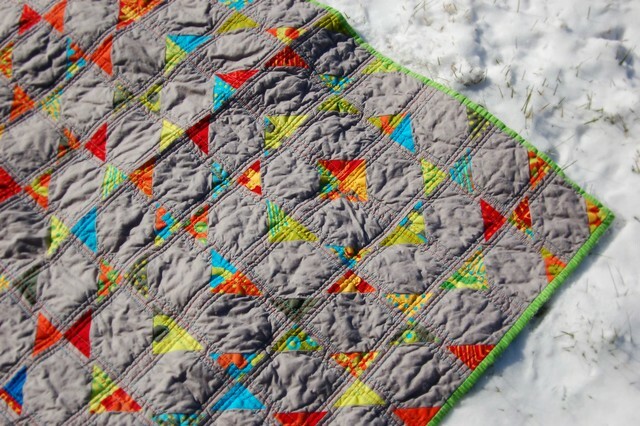 And it’s on its way to little Levi in Florida, where I hope it will not have to see snow again! Lucy and Chad are having a baby. 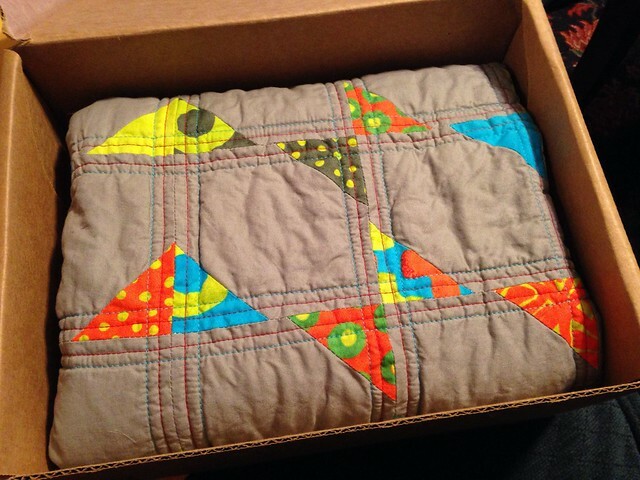 This means that Skylar is going to be a big sister, so when I made a baby quilt, I saved the leftover squares and made a little doll quilt for the soon-to-be big sister. While Mom takes care of baby, Skylar can be right beside her, caring for her own little beanie baby, or whatever toddlers play with now. 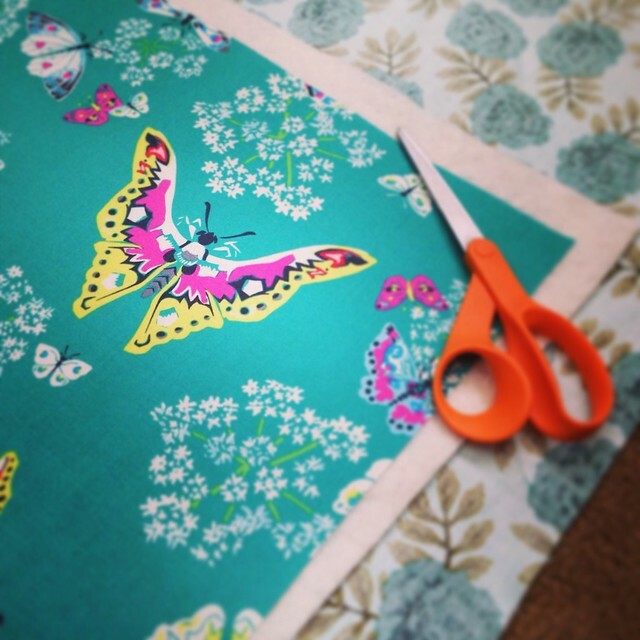 This fabric was a joy! 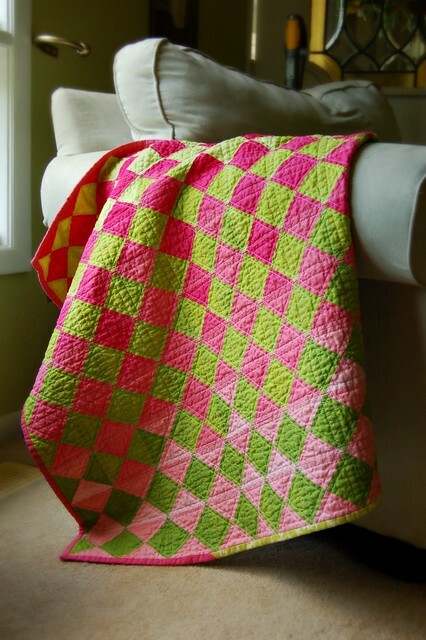 And now that Ansley’s little diamond quilt is finished, it’s time to move on to new/old projects. Thankfully, it just never seems to end! 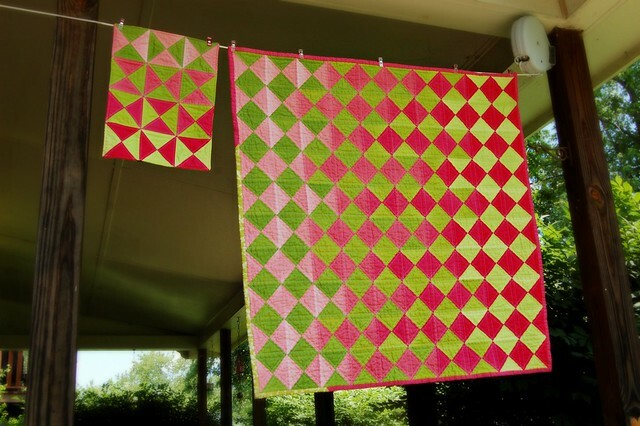 Categories: Crafting for Babies, Quilts, sewing Tags: Baby Quilts, Fabric, Hourglass Blocks, Moda, Ombre, Quilts, Sewing, Simply Color, Solids, V and Co.